Flooring can be a big expense, yet there are ways to you can shrink costs and still get the look you want. If you’re thrifty, creative and willing to flex a little muscle, you can improve your home with affordable flooring that’s not only beautiful but high quality and high performance. 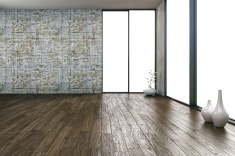 Budget-friendly vinyl – Even if your tastes favor the elegant looks of floors like genuine hardwood or ceramic tile, there are some amazing vinyls available out there. Today high definition digital printing faithfully reproduces the looks of wood, stone, ceramic and other natural materials. Think of any flooring texture, pattern or color and, chances are, it’s represented in vinyl tile or vinyl sheet. Luxurious laminate – Laminate offers another great affordable flooring option that delivers the authentic look and feel of exotic wood or high-end stone at a fraction of the cost. 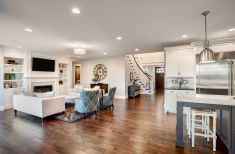 In addition to being easy to install and durable, laminate floors are moisture resistant, which means they can be used in areas where the material they’re imitating can’t be, such as in the basement or laundry room. Bespoke design with affordable flooring – Bring out your inner interior designer and create custom-made patterns in vinyl tile. Choose two colors for a unique checkerboard effect, or try three colors – light, medium and dark shades of the same hue – and alternate tiles and rows in a gingham pattern. For a third stunning visual, create a border of color or pattern around a center of contrasting or complementary vinyl tiles. Do your own installation – With a little bit of know-how and confidence, you can dramatically cut flooring costs by doing the installation yourself. Vinyl tile is a budget-friendly floor that’s perfect for do-it-yourself projects. Peel n’ stick adhesive tiles are so easy to install, you can transform any room over a weekend. Similarly, ease of installation is one of the features that made laminate flooring the fastest growing product in the industry. Laminate systems that use lock-and-fold technology allow quick installation without nails or glue. Maximize your resources – If you’re facing a tight budget yet have a multi-room flooring installation in the works, it might make sense to complete the project in phases. Finish one room at a time and allow a break before starting the next. This approach is easier on your wallet and a cost-effective way to stretch your decorating budget. One of the best ways to change the look of a room is to change the flooring. This simple design trick means you don’t have to renovate the entire room to create a fresh new look for your home.